Includes 10 Super Clear Archival Pages, which are sealed on three sides, load from the top and include acid-free black paper inserts. NEW! Genuine top-grain leather presentation case with multi-ring binder system. 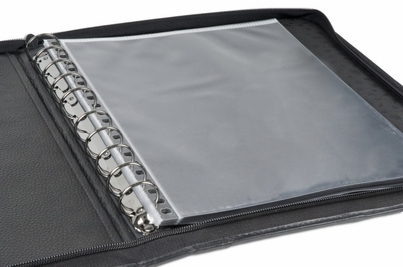 The handle is mounted on the spine of the case, keeping pages hanging straight and preventing bending of pages. Features 1" superior quality steel multi-rings (closes securely and does not snag pages)and two large inside pockets. Insert your artwork, photographs, or documents in our Premium Archival Pages. These superior quality super-clear pages are sealed on three sides, load from the top, and come with an acid free black paper insert. 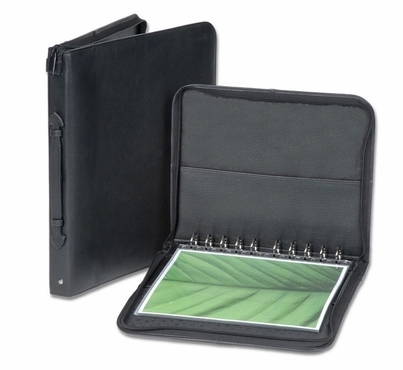 The presentation case holds up to 30 pages, which can be used front and back. Pages fit documents up to 8.5"x11". Pages fit documents up to 9.5" x 12.5"
Pages fit documents up to 11"x14". Pages fit documents up to 14"x17". Pages fit documents up to 18"x24".